You are currently browsing the tag archive for the ‘clay soil’ tag. 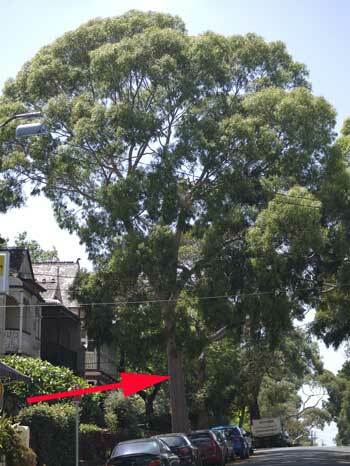 The largest root of this street tree in Marrickville has been severed. It makes for very interesting reading if you are interested in history as well as soil, footpaths & trees as I have become. What makes this letter especially worthy is that 112-years has passed; yet we still encounter the same problems & the same attitudes towards trees & tree roots. THE FOOTPATH AND THE TREES. Sir. For many years it has been an article of municipal creed that the cracks in tar-paved and tar-dressed footpaths are due solely to the roots of trees, and untold numbers of the trees on or along such footpaths have fallen victims to this belief. For several years, distinguished by great drought, I have collected observations on this subject, especially during the present season, and I have arrived at the conclusion that, excepting a single species in common use, the trees and their roots have nothing or very little to do with the cracking of the tar-paving or tar-dressing, that is, directly and indirectly, no more than gas or water pipes or any extended resisting object near the surface. The real cause is, on the contrary, to be found in the physical properties of the soil and the material employed, and this is so obvious now that anyone who cares to see may do so on his way to and from town. Let me explain first the physical properties of materials. The soil is largely or chiefly made up or clay. Now, clay expands and swells when wet, more when warm and moist, than when cold and moist and contracts when drying in the opposite way. 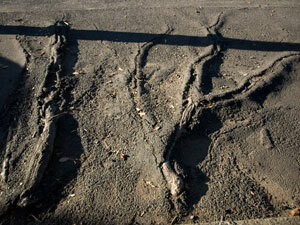 Cracks are then found wherever there is least cohesion. Straws, dry rootlets, pieces of wire, in fact anything notchy, operates in the same way. 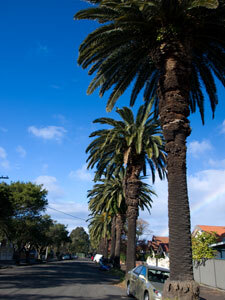 The materials used for tar paving form, on the other hand, a kind of sandstone more or less impervious to moisture. Consequently they form a rigid implastic sheet, entirely subject to contraction by cold, expansion by heat, and in direct proportion to the variation of temperature, viz., from near freezing point to near 200°F. The difference in length with the great extension is, therefore, many inches, perhaps some feet, between kerbing and kerbing. What are the results? Nay, what must they be? Such footpaths are formed usually when the surface of the ground is moist. In this state it is leveled and compressed, and the soft, plastic material spread over and leveled by heavy rollers. As soon as the tar-sandstone sets it becomes a rigid mass, pressing against the kerbing along one side and both ends, and on the other side against the walls, fences, or merely the soil of the opposite side, and in all cases has to overcome, in its diurnal and seasonal motion, the friction between the surface covering and the soil, but it must move somewhere, and does with irresistible force. It occurs in this way between the two forces acting on it. As the clay yields in drying beneath the impervious surface, the latter is depressed and forced down upon it, and slight depressions are formed where the soil is softest-the surface becomes puckered as it were. By the longitudinal strain slight transverse bulges are formed, by the transverse strains between kerbing and walls each in the longitudinal direction. Wherever any pipe, board, wire within a few inches of the surface, occurs there is an extended obstruction to compression. At that place an elevation will remain, and consequently, upward bulging is promoted so long as the surface remains plastic to some extent and the ground beneath firm. As the heat and drought increase the bulges become larger, but the clay soil beneath gradually becomes dry, and the traffic above, be it vehicle or human feet, forces the surface covering down upon contracting clay, pulverising it, while the now rigidly-set tar-paving expands and contracts daily more and more. In its motions the bulges are raised by the strains and compressed by the tread of the passengers until they crack at the weakest spots to relieve the former. Later on the rains set in, the clay soil swells with the moisture imbibed from the ground alongside, or ground and water tables, for moisture must diffuse equally below, and a difference of distance only means a difference in time. The ground not only slips below the rigidly-sat paving or dressing (this the cause of it always being found as loose rubble beneath separated pieces), but also swells most at the bulges, thus exaggerating constantly the elevated spots, these being places of least resistance. The foundation being gone after some time, and the material weak and unyielding in itself, the latter become broken up, and kicked aside by the passers-by. That this is the true explanation, and that the roots of trees are only very indirect causes, one may see most plainly where the tar-paving, crosses bridges and culverts, as in Pirie street, Kent Town, where it is cracked and destroyed, just in the selfsame way as elsewhere, without the possibility of “roots” thicker than a cord being present. If such are supposed to cause the cracks it supposes a magical and superstitious power in them indeed! The above illustrates again the saying of one of our writers, that the generally accepted theories are usually those requiring revision most urgently and it is hoped that in future the trees and shrubs will be spared destruction and ill-treatment for damage of which they are wholly innocent. The fig trees, which furnished the excuse at first, possess the quality of many trees habitually growing in wet or flood-exposed localities, of raising themselves on their trunk-roots above the wet surface. As such are of course, wholly unfit for street or garden planting, but eminently suited for the park lands, where, however, they are rarely found, thanks to the wisdom of the ruling powers. However, of whatever kind, the green foliage of trees and shrubs is probably of far more important than all the footpaths put together for town and country in general, on account of the cooling, air-purifying, and soil-disinfecting properties which it possesses and exercises, not withstanding the superstitious beliefs to the contrary. J.G.O.T. Norwood, April 20, 1901. This was the Council Meeting. All Councillors present. The following is how I understood the meeting & all mistakes are mine. 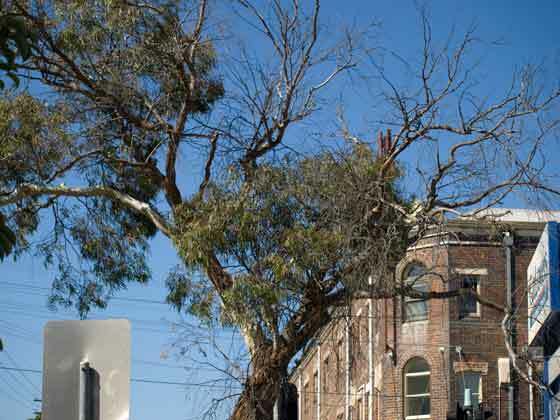 Smoke Free Outdoor environments in Marrickville – This was for the Marrickville LGA & included no smoking in all outdoor areas, dining, public footpaths, sports grounds & fields, at a Council owned buildings, within 10 metres of a Council owned building or a children’s playground, including parks or a bus stop or at any Council outdoor event/function. Recommended to be released for community consultation until 28th February 2011. A resident & representative of the NSW Cancer Council spoke about the health statistics of second-hand smoke. Clr Phillips supported the motion saying the more Council discourages smoking, the more people will stop smoking. Clr Thanos was against the motion saying he supported the right of people to choose. He thought “a blanket ban was dumb & stopping people smoking in a park was ludicrous.” He said smokers have rights reminding that it is legal to smoke. He said there was no one to police this. Clr Wright supported the motion saying smokers are impacting on the health of others & the policy will make people change. Clr Hanna said that despite the report saying so, no one had contacted the Marrickville Chamber of Commerce or the restaurants listed. He said there should be freedom for everyone. Clr Olive said he had concerns about ability to police & no smoking in outdoor areas is a problem. Clr Tsardoulias supported the motion saying he has seen it work in Singapore. Clr Macri thought 50% introduction was better & that it would alienate café owners. Clr Iskandar spoke about the cost of smoking on the health system. He also said every smoker throws their butts that land in the Cooks River. Mayor Byrne thought education was better than an impost. Carried. Against Clr Thanos, Hanna, Macri & Olive. that the tree caused the damage to the fence at the front of the property. 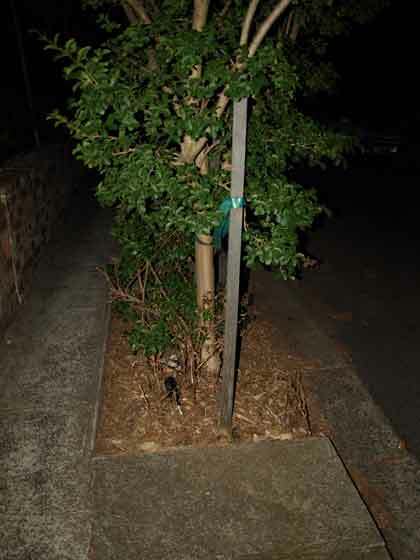 Council refused the application to remove the tree. Behind the 500 mm high brick fence the yard is a 350mm high raised garden bed with a 2 metre Callistemon & low plants. 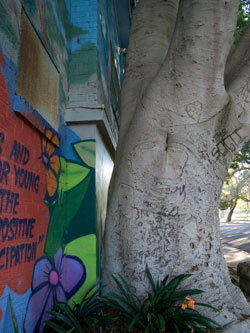 The owner spoke saying that the street tree had caused a crack to his brick fence. He wanted the tree removed & replaced with a “less invasive version.” Clr Thanos said Council should remove the tree because of the distress it is causing the resident. He said the tree will cause more damage & that the staff report was not helpful. Clr Olive did not support the motion saying that while the distress of the resident is important, the report said there was minor cracking. 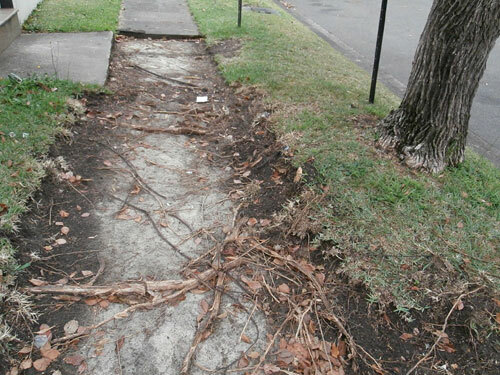 He said the crack can be re-pointed & doesn’t justify removing a tree valued at $1,500. 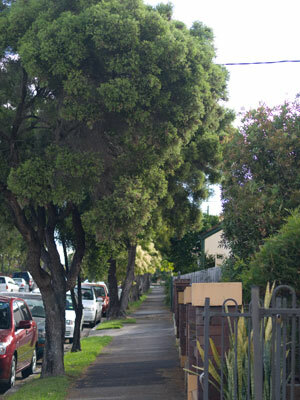 Clr Tsardoulias said that the photos of the footpath tell him that the tree is affecting the fence & that street trees are affecting the whole estate & endangering people’s property. He supported the motion. First vote was on Clr Thanos’ motion to remove the tree. In favour: Clrs Thanos, Hanna, Macri, Byrne & Tsardoulias. Against: Clrs O’Sullivan, Wright, Olive, Peters, Phillips, Iskandar & Kontellis. Motion failed. Then the vote was on the staff recommendation to retain the tree. All Councillors voted for this except for Clrs Macri, Hanna, Thanos & Tsardoulias. We have just experienced a long & protracted drought & more than 3/4s of NSW is still regarded as drought-affected. The long-range weather forecasters say we have entered into another phase of drought. 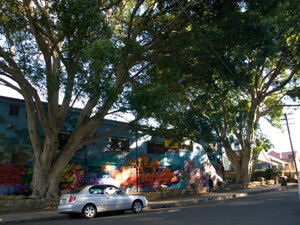 The Inner West has been affected, as has the whole of the Sydney metropolitan region. This drought has resulted in severe water restrictions & this has affected our soils to a great degree. 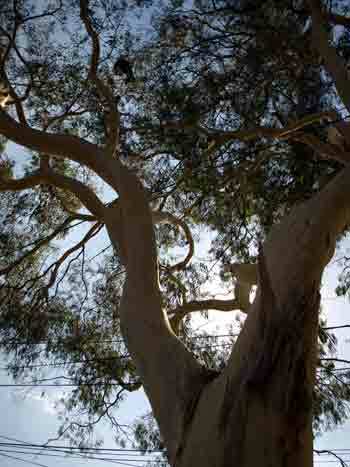 Trees are stressed & quite a few have died within our local LGA. Many of the saplings Council plants do not survive the summer because they are not watered. This must result in significant financial loss to Council. bitumen. I have only seen 4-5 street trees planted in cement where I feel they have been given adequate soil space around them to give them a fighting chance to capture rainwater. Two were in a back street of Newtown & I doubt Council did this, as the kerb had been removed. Both these trees had a lot of soil around their trunk. The other example is new plantings bordered by raised brickwork on Unwins Bridge Road Tempe. I think it would be wonderful if all our street trees that are in cemented areas could be planted in this way. I would also very much like to see Council give funding for the watering of young street trees as they do in other Councils. 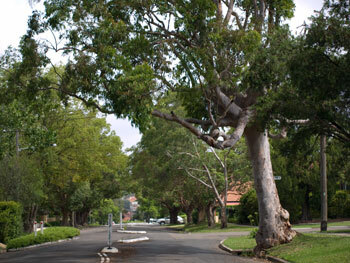 Much of the Inner West is built on clay soils. Clay soils are quite volatile as they shrink when they do not get sufficient water & expand when there is too much water. 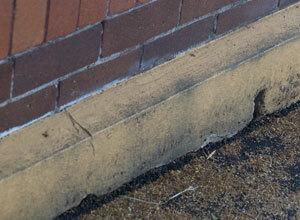 Both these extremes affect the foundations of buildings & footpaths. The term Seasonal Fluctuations describes the normal variations of the moisture content of clay soils through the seasons. When clay soil gets a lot of water it is called Field Capacity. When the soil is dry due to evaporation, heat & lack of rain during drought it is called Desiccated & suffering from Soil Moisture Deficit. If a drought is lengthy & the soil does not return to Field Capacity after some rain & then enters into another dry period, it is called Persistent or Permanent Moisture Deficit. This is likely to have already occurred in the Inner West or will do during the next period of drought in which we are now entering. Soil movements cause what is termed Subsistence & Heave. With Subsistence, the soil moves downwards. With Heave, there is an upwards or lateral move of building foundations or footpaths. While the clay soils go through Seasonal Fluctuations foundations of buildings don’t move much, though that depends on how much clay soil is directly under the foundations. When the clay soil suffers from Persistent Moisture Deficit, foundations of buildings move & walls start to show cracks, paint peels & doors & windows are suddenly off balance. Just last week our front door over night became hard to open & stiff on its swing. It is recommended that you don’t fill in the cracks or shave wood off door or window surrounds when the ground is dry, but wait until the soils have returned to normal moisture content before doing repairs. Most times the doors & windows will realign & the cracks will come closer together though paint work will need repairing. If you do fill cracks while the soil is dry, the space will not be available for the building to move back into place & new cracks will appear, generally on the other side of the building. The experts suggest occasional watering of the exterior of the house as this will help keep the clay soil moist so that your foundations don’t move during a drought. In my case, I have been keeping the water up to the back garden, but to save water, I have left the front garden manage as best it can. Here is the reason why our front door has moved. Also, it is our hallway & the front room that are suffering the cracks & peeling paint. 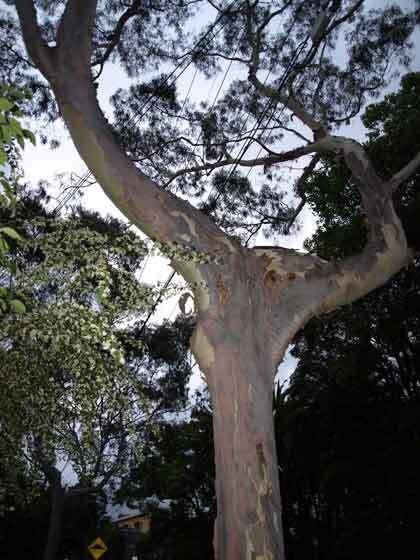 My research has shown that trees can increase the seasonal movements of clay soil, however, engineers also stress there are too many factors to consider before one blames the presence of a tree for causing the damage. 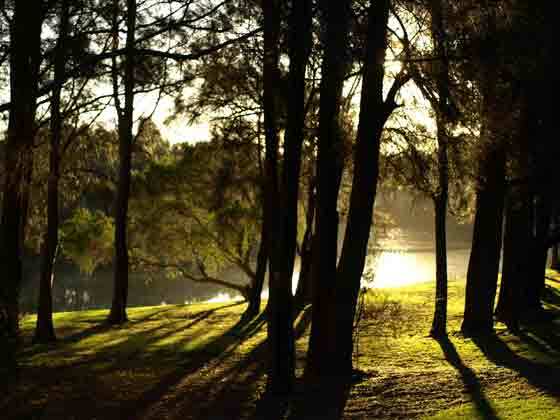 One of the problems is, if a mature tree is removed, this has a major impact on clay soil moisture & the property can actually sustain more damage as the soil fills with water & starts a process of Heave. It is hard to stop Heave because there is no longer a tree to be taking up the excess water. Because it is so difficult to categorically say that tree roots cause damage even if the roots do go towards & under the house, many engineers recommend using water to restore the water levels to clay soils rather than removing the tree. I have read that a tree is not able to lift a house because of the weight of the house. A footpath is a different story. There are things we can do to minimize or prevent further cracking or movement of buildings which do not involve removing trees. According to eminent scientists, we have entered a dangerous period of existence with CO2 levels actually threatening life on this planet. All agree on the supreme value of trees. Just today in Copenhagen, the Food & Agriculture Organisation of the United Nations & Brazil’s National Institute for Space Research signed an agreement to work together in the field of emissions measuring and reporting by monitoring forests & calculating CO2 sequestration. Essentially they are going to map & monitor the green canopy of forests of the world. This clearly demonstrates the value of trees in dealing with climate change. We should only be removing them after all options have been exhausted.